CCGS Vancouver above is at Ocean Station Papa, the North Pacific weather station. Those days are long gone. The job of early weather detection is now done by satellite. 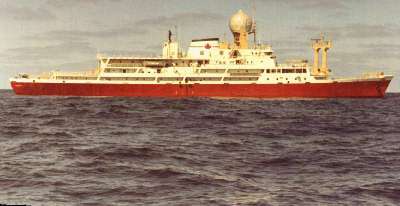 The ship and its sister ship the CCGS Quadra, were used for weather and oceanographic work in the middle of the Pacific Ocean. 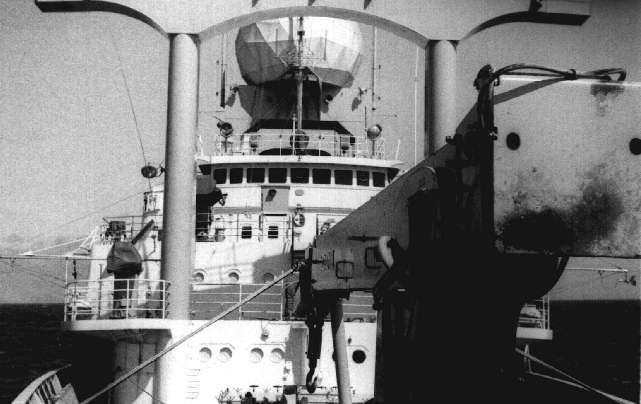 In the sixties and seventies, the Pacific Oceanographic Group had personnel on board to study the ocean and everything it had to offer science. Each trip lasted a total of 7 weeks. The weather "MET" men studied weather by releasing balloons and using the special radar. They also advised international flights and ships at sea about weather in the Pacific, and sent all their data to the weather center in San Fransisco. Weathership CCGS Vancouver in Burrard Dry Dock Ltd. Port of Vancouver. Canadian Coast Guard got two brand new weatherships, the CCGS Vancouver and CCGS Quadra, to replace the old Second World War St. Catherines and Stone Town,. These modern ships saw most of their service in the 70's. They had 86 men and spent seven weeks each in the middle of the Pacific Ocean. The writer made four of these trips to Ocean Station "Papa." 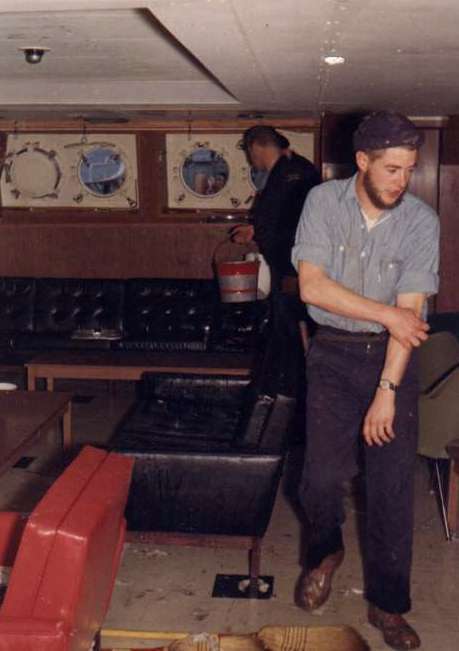 On the last trip, the weather was so rough that the forward, officer's lounge portholes, were punched in. The waves were 20 meters crest to trough, one of which took the forward crane (in foreground) with it. The sister ship, which we were relieving in the hurricane, was limping into port with damage. I had just landed my job with the Canadian Coast Guard. My first assignment was St. Catherines. It was a small ship by comparison with the new sister ships. I was a steward on board, and my job was to help mothball the ship. The boatswain was a Dutchman, who would always tell me "If I were a young man, I'd ship out on a Norwegian." Some of his words must have sunk in because a year and a half later I was on the M.S. Tresfonn, a Norwegian bulk carrier. After a month on the "St. Kits," I was introduced to the CCGS Quadra. It was Captain Nesbitt's last voyage, and one he would not forget. He planned to retire after this final trip, so he wanted it to be special. But the weather didn't know or care a thing about this old sailor's wishes. The trip would be special alright. The wind was gusting to over 100 km per hour on shore, and he was supposed to take his ship into it, plus travel 3 days to the birthplace of the worst weather in the North Pacific. And I was going with her. The sister ship that was out there in the storm was damaged. Reports came in that she was limping back to port with only one generator running. Captain Nesbitt was going out to get his share with his crew. The one thing you needed in a storm was power. If the last engine were to go, that would be it. Well, there was nothing he could do about the weather. He was ready to go, and so was I. I had been aboard in rough weather before, and did not think this would be much different. Well, I was wrong. Pulling out of Esquimalt, it looked like it might not be too bad, except when we got out to the continental shelf, the waves suddenly grew and really gave the aluminum/steel vessel a wild ride. The superstructure was aluminum, which had cracks every time we came back to port. The huge waves made getting the old sea legs a little harder this trip. Perhaps it would have been prudent to slow the ship somewhat, but captain Nesbitt was determined to get to station Papa on schedule dispite the weather. 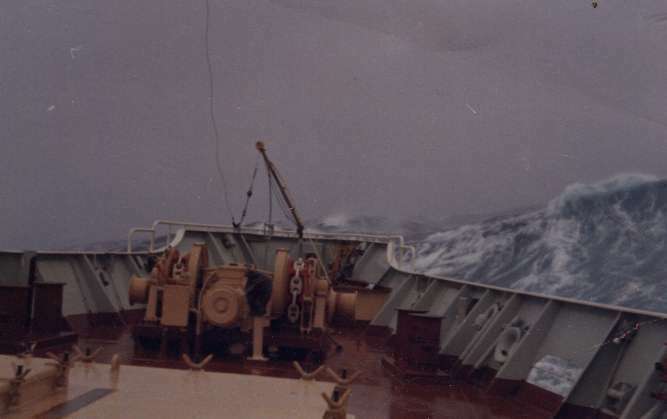 The CCGS Vancouver steamed straight into a howling hurricane at 16 knots. Contrary to popular belief that the Pacific Ocean is calm, it was sure showing its wild side now. It was rough but we seemed to be managing. There was talk that the waves were hitting the wheelhouse. That's bad. I knew that this was not an ordinary storm. I went over to the helicopter deck after supper with Mike and we were fooling around to see how high we could jump like a couple of kids. If you timed it right, you could jump perhaps a meter straight up without too much trouble. The next morning I was puttering around the officer's mess when I heard this huge thump and saw water gushing as if from a firehydrant, right past the officer's mess. My first reaction was that we must be sinking, so I ran up to C deck, but still felt the ship swaying, so I ran back down to the torrent of water like rapids flowing down to the lower decks. One seaman was being taken to the ship's hospital with blood flowing down his face. The captain announced over the public address system that the ship would be turning about to put the stern into the waves so that damage can be assessed, and repaired. Plywood was put over the portholes that had been smashed in, and the sea water was mopped up. The forward winch was gone along with most of the portlights and deadlights in the forward lounge. Almost everyone was scared. I checked every stateroom to make sure everyone was OK. Some of the men were saying their prayers, and I don't blame them. The ship was tossed about like a cork. If this doesn't teach you respect for the forces of nature, nothing will. You really have to know what you are doing to be out in this weather. No wonder they call it a weather ship. Notice the winch is missing from the bow but is in the previous pictures. Half of the hull portion of the ship must have gone into one giant wave. Fortunately nobody was seriously hurt physically, but many would never come out here again, including the writer. This ship will be on its way. Oh, I'm going home, I'm going home, I'm going home. A job on shore I will find. The guitar and the Sea - A German song about a guitar and the sea by Freddy Quinn. A hit many years ago. Seeman - by Freddy - an old German Seaman's song. 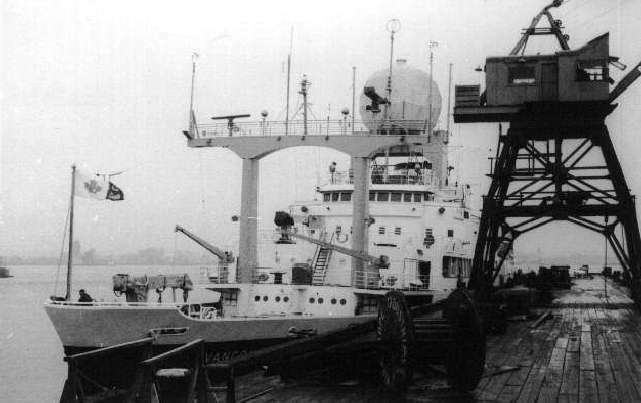 The grid area was off-limits to all ships by international treaties, but a Soviet ship came straight toward us, then turned and showed off its hammer and sickle. Soviets had their own rules I guess - not very cooperative folks.